If you are wondering how to get bleach out of carpet, we can help. Our experts are trained carpet and rug dyeing professionals that can repair colour damage caused by bleach, peroxide, or household cleaners. Watch a beautiful demonstration from a partner of ours, The Rug Colorist in Florida, US. Learn about bleach repair and colour restoration services on this page. 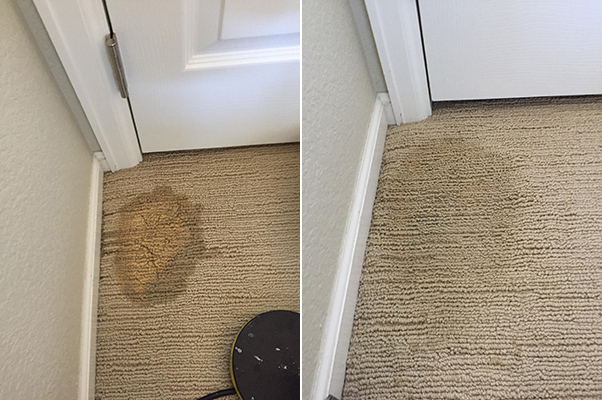 If you need to get Clorox out of your carpet, you might feel discouraged. Luckily we can fix the darker “bleach stains” that standard bleach leaves on your carpet. There are a variety of products that can bleach your carpet. If you’ve spilled face wash or peroxide you might have noticed light spots on your carpet. We can help! Kitchen and bathroom cleaners can leave different spots on your carpet depending on the product and carpet colour. We can fix blue, purple, yellow, orange and white spots. Bleached carpet can be embarrassing to look at. Luckily we can remove bleach “stains” with confidence. How Does Bleach On Carpet Repair Work? Wondering how to get bleach out of carpet? Bleach removes dye pigments from the flooring. Therefore, if you want to fix bleached carpet you have to restore the lost colour pigments. This is how it works – our experts determine the colour of your carpet or rug that is bleached. They then determine the colours missing from the bleached area. Once the colours are determined, the expert mixes a custom dye formula out of the missing colours. The dye is then applied to the carpet or rug with a syringe or airbrush. The colour is restored before your very eyes! Have questions? Ask us! 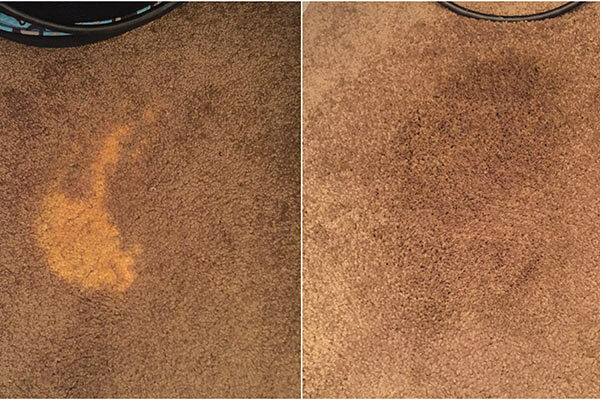 We are experts in bleach on carpet repair and fixing peroxide and chemical marks. We are here to help give you the best advice and service possible. We are willing to drive upwards of an hour to fix your bleach spill. You start by mailing us a fiber sample of your carpet and we determine if it’s viable. We then set a date and fix the bleach.